The local housing market is expected to gather steam in the first half of this year, after cautious consumers shunned buying at the end of last year due to global economic uncertainties. Datuk Seri Michael K.C. Yam, president of the Real Estate and Housing Developers' Association Malaysia (Rehda), said people are more confident on the Malaysian economy now despite uncertainties in developed countries. Yam said the Economic Transformation Programme, the Government Transformation Programme and projects like the mass rapid transit and River of Life have garnered confidence in the market. "They will have spin offs, creating jobs and business opportunities," Yam said yesterday, at the Rehda property market update for the first half of the year. A Rehda survey found that 79 per cent of the 148 developers who responded were optimistic of the first six months of this year compared with 81 per cent in the second half of 2011. Some 63 per cent said they will launch new projects in the first six months of this year, against 58 per cent in the preceding six months. Seventy-four per cent of the respondents said they will increase their selling prices by five per cent to 20 per cent this year. "This is due to the high costs of building materials and labour, which continues to be major challenges for the industry. Land cost is also increasing and we have no choice but to pass it on to customers as our margins are eroding," Yam said. The survey showed that 38 per cent of respondents are facing challenges with building materials, particularly the pricing of bricks, cement and steel bars, and it is having an impact on their cash flow. 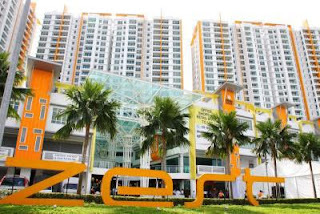 Meanwhile, the first Malaysia Property Exposition (Mapex) for 2012, organised by Rehda, will be held from March 2 to 4 at the Mid Valley Exhibition Centre here. Rehda immediate past president Datuk Ng Seing Liong said Mapex is expected to generate property sales of up to RM100 million, slightly more than last year. Some 60 developers, including a small portion of foreign players, will showcase over 200 housing developments. KUALA LUMPUR: A majority of developers expect property prices to continue climbing in the first half of the year in tandem with rising costs. In a recent survey of members by the Real Estate and Housing Developers' Association Malaysia (Rehda), about 74% of respondents surveyed generally felt that prices would be on an upward trend, largely influenced by an increase in the cost of development. Rehda president Datuk Seri Michael Yam said about 36% of the respondents said property prices might increase 10% to 20%, 31% expected prices to increase less than 10%, and 7% expected prices to increase more than 20%. “The main reason cited was the escalation in land, building materials and labour costs. For example, steel bar price had climbed to RM2,589 per tonne in 2011 from RM2,285 in 2010, while cement had gone up to RM16.33 per bag in 2011 from RM15.64 in 2010,” he told a briefing yesterday on the Rehda Property Industry Survey for the second half of last year. Two other main factors were the larger deposits required in obtaining housing development licences and the higher market demand. The deposit for a housing development licence is now 3% of the estimated project cost instead of RM200,000 previously. The survey covered 148 companies or 15% of Rehda's 979 members, and they were selected from all the states in Peninsular Malaysia. Yam said 63% of the respondents indicated that they planned to launch projects in the first half of this year. In comparison, 45% had launches in the second half of 2011. “The top property types to be launched in the first half of this year are two-storey terrace houses, apartments and condominiums as well as service apartments,” he added. The survey also reported that better sales were expected in the first half of this year compared with the preceding six months. About 67% of the respondents with planned launches in the period under review anticipated to sell 41% of their properties and above. Yam pointed out that this was despite the drop in confidence largely influenced by external factors. “Some of the external factors are the eurozone sovereign debt crisis, fragile US economy and volatility in commodity prices. “Nevertheless, the Malaysian market is still buoyed by its relatively strong economy, low non-performing loans for the property sector and the Government Transformation Programme and the Economic Transformation Programme (GTP/ETP),” he said. On challenges for the industry, Yam said the unsold designated bumiputera lots had been the main reason for unsold units recorded in the last four surveys, which were conducted every six months. “Additionally, more than half of the respondents believed that the real property gains tax would have an impact on the overall property market. “Other than that, 48% of respondents reported that they faced financing issues but mainly in the end-financing for buyers due to buyers' creditworthiness as well as due to banks being more stringent in their lending policies,” he said. Rehda Federal Territory branch chairman NK Tong said the 45% of respondents that reported launches in second half of 2011 represented a slight drop from the 58% in the first half of 2011. “The average size per project launch has also declined to 145 units from 160 units for the period under review,” he said. “Sales were encouraging for the period as more than half of respondents who had launches sold more than 40% of their launched units,” he said, adding that the majority of the units launched were landed properties, but Kuala Lumpur and Penang were more focused on strata-title properties. Rehda announced that the first Malaysia Property Exposition for 2012 would be held from March 2 to 4 and would feature some foreign developers. Brand new: The Zest Serviced Apartment @ Kinrara 9 is completed ahead of schedule. The Trinity Group team shifted into high gear as 2011 drew to a close — and delivered a full schedule ahead for the much-awaited launch of The Zest Serviced Apartment @ Kinrara 9. Dreamed up to be the next prime address in Bandar Kinrara 9 offering an integrated location for family, work, business, leisure, and entertainment — The Zest @ Kinrara 9 became an anticipated reality at the official Key Handover Ceremony recently. The company is right ahead of target with the completion of an integrated development that consisted of 20 units of shop offices, 24 units of retail outlets and 720 units of serviced apartments in the Bandar Kinrara 9 township development — with infusions of modern and contemporary architectural design. “The launch of The Zest @ Kinrara 9 marks our foray as a serious contender and comprehensive player offering a gamut of services in the real estate industry,” said Trinity Group managing director Datuk Neoh Soo Keat. Moving in: Lok Jean Hui (left) is among the 720 homeowners receiving his key from Neoh (right) while Chor looks on. Trinity Group’s long-standing commitment towards “building communities and enriching lives” is strongly reflected in its developer journey as it grew from strength to strength with each project. Its credo echoes the Malaysian government’s dedication towards ensuring quality and affordable housing to meet the needs of Malaysia’s growing population by matching demand and supply as well as providing efficient public utilities and services as well as a clean and livable environment. 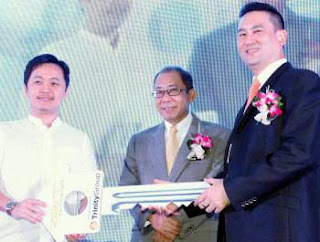 Housing and Local Government Minister Datuk Seri Chor Chee Heung was the guest-of-honour at the key handover ceremony. He said it was imperative for the Government and private sector to work together in order to create a competitive and sustainable housing industry. “The partnership will benefit the homeowners as well as housing developers. I am pleased to see Trinity Group taking a leader role in raising the industry bar for private developers and employing the six thrusts in the National Housing Policy (NHP) as its guiding principle to achieving conducive and liveable environments and shared community infrastructure and foundation,” he added. Being a resident or business owner in one of the units at The Zest Point means all-year access to amenities. Trinity Group does not take community enhancement lightly; its service-focused vision spanning beyond property development is attested by its series of community projects such as a RM7mil access ramp, a RM3mil access road for The Z, and Malaysia’s first air-conditioned bus stop. The ramp, linking the opposite side of the road and The Zest @ Kinrara 9 with the Bukit Jalil Expressway to lessen traffic congestion and commuting time, was launched by Chor. Community development, to Trinity Group, is an on-going pursue. “We do not ­— and will not stop here. In the near future, we will undertake more development and community projects that are aimed to improve and enrich people’s lives”, said Neoh.